Paul Rudd may have the gift of eternal youth, but he admits that Chris Hemsworth has him beaten when it comes to fitness. 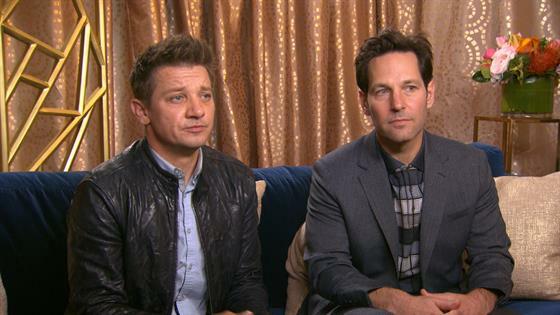 The former star, 50, reprises his role of Ant-Man in the upcoming film Avengers: Endgame alongside the latter actor, 35, who portrays fellow superhero Thor. Hemsworth works out extensively to maintain his character's godly and ridiculously buff figure. "I'd been working out really hard," Rudd said on BBC's The Graham Norton Show on Thursday while sitting alongside Hemsworth. "I'd been eating really great for years and years, and then, when we were filming, I stood behind Chris just after we'd got out of our suits and I thought, 'What is the point?'" "We're basically comprised of similar materials but there is this [pointing at Hemsworth's body]," he continued. "And then there's Ant-Man." Avengers: Endgame, the conclusion of the hit Marvel superhero film series, is the first Avengers film featuring Ant-Man. Hemsworth has appeared in all of the movies. "I felt like there was a great party going on and I didn't get an invite," Rudd joked on The Graham Norton Show. Both actors have also starred in their own standalone films. Avengers: Endgame is set for release on Friday, April 26.